What are free radicals and why I should be worried? Free radicals are a skincare issue that is always talked about but rarely explained. Let me help you to understand what a free radical is, and how to prevent them causing common skin concerns. Absolutely everything including us and the air around us is made of molecules. Molecules are made of atoms and atoms are made of pairs of electrons. When an atom is missing an electron, it is defined as a free radical. Free radicals can damage the skin taking an extra electron from atoms in the skin. When atoms are taken away from molecules in the skin, it causes damage to our skin’s DNA that can speed up the aging process. What does free radical damage looks like? Free radical skin damage can appear in several ways such as changes in skin colour including brown spots and broken blood vessels. Free radicals also break down the skin’s collagen and elastin fibres causing wrinkles and loss of tone. Antioxidants are compounds that can give an electron to the free radical so it doesn’t need to take one from our skins atoms. Some well-known antioxidants include vitamin A, C and E. Make sure you look for products with these antioxidant or anti-free radical ingredients in. 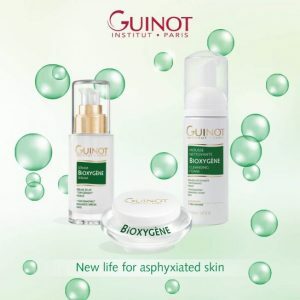 My favourite is Guinot’s BiOXYGENE cleansing foam and Radiance cream. Combined together these products will give your skin a spring clean and protect you from harmful effects of the environment.